Krakow contains Wawel Castle, the royal castle of the Polish kings, dozens of churches and cathedrals, and a great many palaces and houses dating from the Renaissance with romanesque, gothic and baroque edifices standing side by side. The old central district of the city has been inscribed on UNESCO's World Heritage List of sites designated as having "outstanding universal value to mankind." Today, combustion of coal by industry and for domestic and commercial heating leads to high atmospheric concentrations of sulfur dioxide and black particulate matter. As a result, building exteriors and interiors are becoming soiled by the deposition of black airborne particles. Museum collections are particularly vulnerable to damage because only one of the many museums in Krakow possesses an air filtration system, and because certain objects (e.g., tapestries; historically important clothing exhibits) are very difficult, if not impossible, to clean if they become covered with soot. Elemental or "black" carbon particles are generally associated with particles of a few tenths of a micron in diameter. Once lodged in the pores in surfaces, these very fine black particles cannot be removed easily, and therefore, are of particular concern. Larger particles, generally a few microns in diameter or larger often consist of soil dust, which is usually brown in color. Much other airborne particulate matter consists of light-colored ionic material, or organic matter, which is often yellow in color. It is possible to measure the mass flux of particles to surfaces, and to measure the darkening of surfaces by optical methods. In addition to soiling, damage to objects could occur from chemical degradation due to reactions with gaseous pollutants such as sulfur dioxide, ozone, and nitrogen oxides. Ozone present in the indoor atmosphere of museums can lead to the fading of organic artists' pigments and textile dyes that are present in paintings, tapestries and historically important clothing exhibits. During the summer of 1993, ozone concentrations were measured in outdoor air and withing the interior galleries of five institutions that house cultural properties in Krakow. The purpose of these experiments was to determine the degree of penetration of outdoor ozone into these museums, and in the case of the National Museum to determine the effectiveness of the existing ozone removal system at that site. Coal combustion and combination of gasoline and diesel fuel by vehicles leads to soot production, and to the emission of reactive gaseous air pollutants including sulfur dioxide and oxides of nitrogen. A year-long experiment was conducted both inside and outside the Wawel Castle and the Matejko Museum, beginning in July, 1993.
a. The gaseous pollutants sulfur dioxide and nitrogen dioxide were measured inside and outside both facilities for a year. b. The concentration and chemical composition of airborne particles was measured for that year both inside and outside these two sites. Particular attention was paid to measuring the concentration of black elemental carbon particles that have great potential to damage the collections. d. Particle deposition rates onto surfaces and particle filtration system effectiveness both depend strongly on the size of the particles that are transported. In order to better understand the particle deposition processes within these facilities, and to assist future control system design, detailed particle size distributions were measured using a micro orifice uniform deposit impactor (MOUDI) during an intensive week-long experiment in July, 1994. Particle morphology and size were also examined using a scanning electron microscope equipped with an X-ray spectrometer. e. The effectiveness of the airborne particle filtration system located in the National Museum was tested by measuring fine particle and coarse particle concentration and chemical composition both upstream and downstream of the filters that process the inlet air to the building from outdoors. Five of the many museums and cultural institutions in the city were examined during the course this investigation. Their locations and other relevant features of the area are shown in Figure 1. 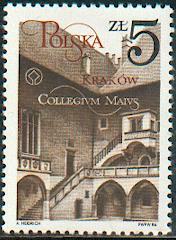 The most intensive studies were done at the Wawel Castle and Matejko Museum. The Wawel Castle is located on a hill 20-25m above the city at the southern end of the central district. The first brick edifices were built in the 10th and 11th centuries and a magnificent Gothic castle existed by the 14th century during the reign of Casimir the Great. This castle was destroyed by a fire in 1499. A few years later a new Renaissance palatial residence was built with great influence from Sigismund I. 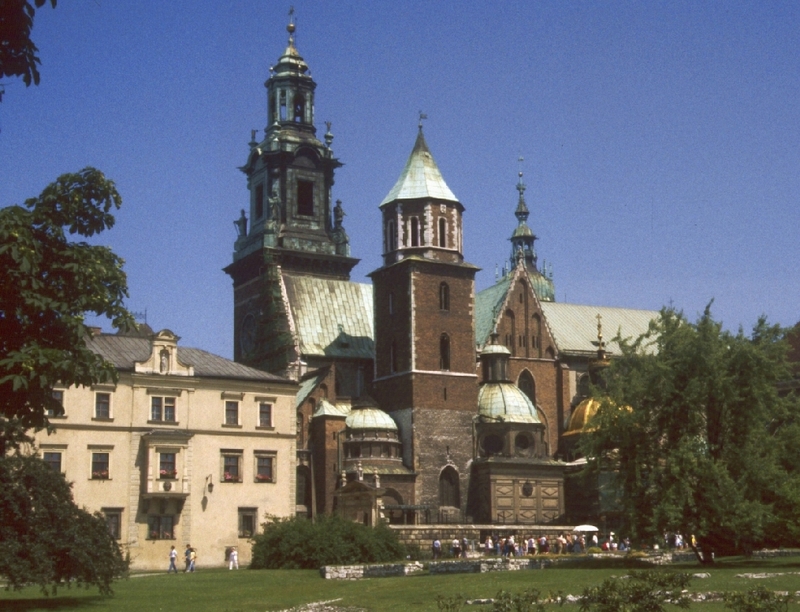 The Royal Castle and Sigismund Chapel are the main features of Wawel Hill today. Sigismund II Augustus bequeathed his collection of tapestries from Brussels to Wawel and they form an important part of the collection in Wawel Castle. The Matejko Museum is the former home and studio of the eminent historical painter Jan Matejko. It became a museum shortly after his death in 1893. It houses a collection of oil paintings, historical costumes, and furniture of Matejko. These two sites were chosen to be representative of the central district. Three other sites were included in additional investigations. The new building of the National Museum is the only museum in Krakow to possess an air filtration system. It is located on a heavily trafficked street just outside the central zone of the city and is exposed directly to pollution from vehicle exhaust. 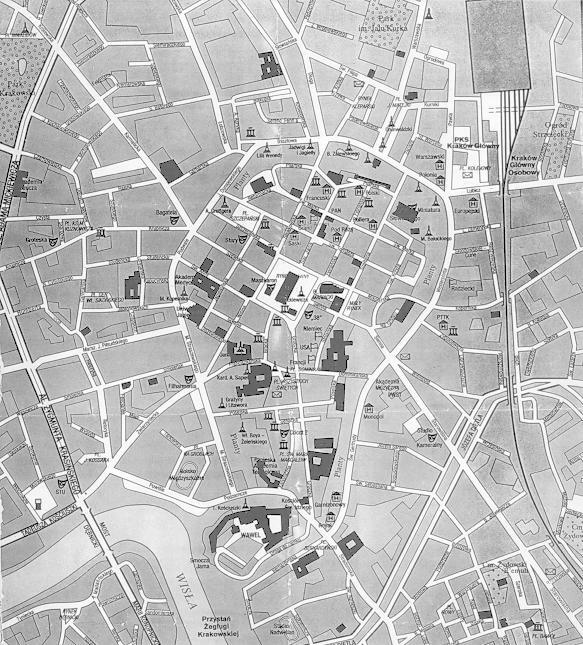 The remaining sites studied here are located within the former walls of the old city, now marked by the ring road shown in the center of Figure 1, in an area where vehicle use is severely restricted. Indoor and outdoor ozone concentration measurements were made at the National Museum. Measurements of particle concentrations before and after processing by the museum's air filtration system also were made at this site. Also included in ozone monitoring investigations was the gothic Collegium Maius, the oldest building of the Jagiellonian University which dates from the early 15th century. Today it houses the Jagiellonian University Museum including the personal belongings of university professors, university jewels, such as sceptres and rings, and unique scientific equipment which was once used for research including instruments used by Copernicus. The museum collections hold rare late-fifteenth-century astronomic instruments and an eleventh-century Arab astrolabe, as well as paintings of Eugene Delacroix and Jan Matejko, baroque tapestries of the Duke de Crequi, and a large collection of medieval sculpture. Ozone monitoring was also performed at the Cloth Hall ("Sukiennice") located in the Market Square. The present structure was built by King Casimir the Great in the fourteenth century. It survived until the mid-sixteenth century when it was gutted by fire. Soon afterwards the building was reconstructed and was refurbished in Renaissance style. Today, the ground floor of the main hall is occupied by wooden stalls selling local crafts. The upper floor of the Cloth Hall houses the Gallery of Polish Nineteenth-Century Art. Photos of Glen Cass working on the project. My complete list of publications.